"Sampath Speaking" - the thoughts of an Insurer from Thiruvallikkeni: Clock towers ! ¬ and the clock that always runs wrong !! Clock towers ! ¬ and the clock that always runs wrong !! 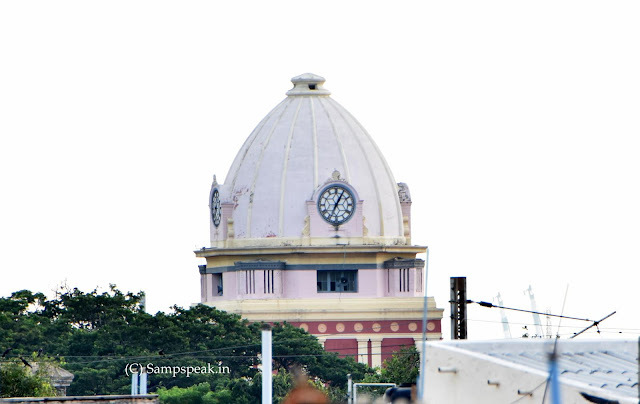 At a time when time was at a premium and not many possessed watches – there were those ubiquitous clock towers; yes clock-towers as landmarks – some of the famous clocks include the one at Central, at Presidency college, P. Orr & sons, Madras University and many other bus stands……… Britishers built lot of things which were landmarks……….. the Royapettah Clock Tower was certainly a landmark, before the EA Mall became the fad. At home, have seen some elders have the time in watch set a few minutes faster – that way – one could get a warning they would say .. .. I always wonder whether that will work at all – when one is aware that the clock is running 10 mins or so faster, would not we always reckon that extra time and somehow contrive to be late ! Edinburgh is the capital city of Scotland since at least the 15th century. Edinburgh is the seat of the Scottish Government, the Scottish Parliament and the supreme courts of Scotland. The city has long been a centre of education, particularly in the fields of medicine, Scots law, literature, the sciences and engineering. Arrive in Edinburgh on any given day and there are certain things you can guarantee. The fairy-tale Gothic of the royal castle, built on an extinct volcanic plug. The medieval riddle of alleys and lanes. The majesty of the churchyards and macabre spires set against a barb of basalt crags, all as if created by a mad god. 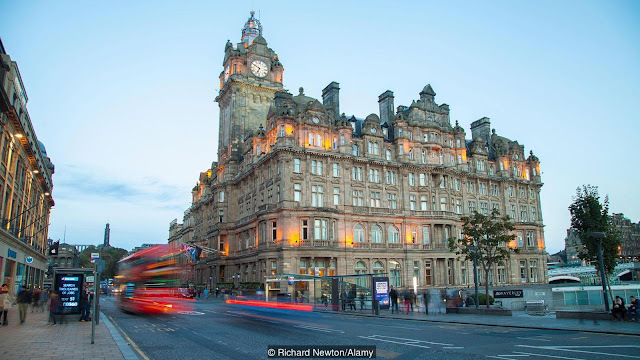 Yet there is one other given in the Scottish capital, and it is the hallmark of Princes Street, the city’s main thoroughfare that runs east to west joining Leith to the West End. The time on the turret clock atop The Balmoral Hotel is always wrong. By three minutes, to be exact. While the clock tower’s story is legendary in Edinburgh, it remains a riddle for many first-timers. To the untrained eye, the 58m-high landmark is simply part of the grand finale when surveyed from Calton Hill, Edinburgh’s go-to city-centre viewpoint. There it sits to the left of the Dugald Stewart Monument, like a giant exclamation mark above the glazed roof of Waverley Train Station. Except, of course, that the dial’s big hand and little hand are out of sync with Greenwich Mean Time. It is a calculated miscalculation that helps keep the city on time ! This bold irregularity is, in fact, a historical quirk first introduced in 1902 when the Edwardian-era building opened as the North British Station Hotel. Then, as now, it overlooked the platforms and signal boxes of Waverley Train Station, and just as porters in red jackets met guests off the train, whisking them from the station booking hall to the interconnected reception desk in the hotel’s basement, the North British Railway Company owners wanted to make sure their passengers – and Edinburgh’s hurrying public – wouldn’t miss their trains. Given an extra three minutes, they reasoned, these travellers would have more time on the clock to collect their tickets, to reach their corridor carriages and to unload their luggage before the stationmaster’s whistle blew. Still today, it is a calculated miscalculation that helps keep the city on time. Today, the wrong time is taken for granted in Edinburgh, not because of retrospective sentimentality, but because familiarity breeds affection. “There’d be a public outcry if it was ever on time”. -mostly reproduced from an interesting article in BBC Travel. The trip with https://www.imanali.in/ is the best thing for the people who want to visit the different types of places. This will make them able to have the joy of the different types of destinations. The beautiful sights of these destinations will make feel joy .